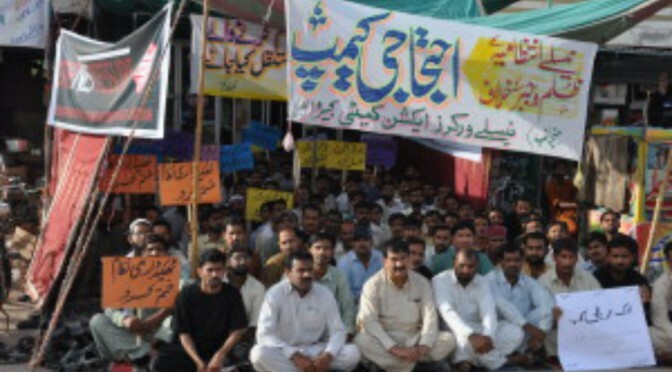 Socialist Movement Pakistan (CWI-Pakistan) is engaged in an important struggle to defend the workers in a Nestle factory at Kabirwala (Punjab). The Nestle management has forcibly locked out the 800 low paid contract workers from the factory since September 2015. Management instructed the gate security to stop the workers from entering the factory – none of the workers are notified of termination of their contract prior to this. These are highly low paid, poor workers and their families are facing hunger and starvation because of forced sackings. They waged a protest outside the factory gates for 48 days. They were broken off with the help of police. Now the Management is witch-hunting the Union leaders and other key union activists with the help of Police. FIR (First information report) is filed at the police station against 89 key union activists. The President of the union, Muhammad Hussain Bhatti, is already behind bars for more than one month. He and others also face draconian “anti-terrorism laws”. The Nestle management signed an agreement with the union in 2012 in which it was agreed that the management would regularise the services of 588 contract workers and that they would get all benefits provided for under the labour laws. Now, the management is violating the agreement and trying to replace the contract labour in violation of this agreement. 1. All contract workers should be regularised. 2. Management should lift the ban on workers entry into the factory, and allow them to return to work. 3. Withdraw all baseless false cases and accusations against union leaders, union activists and workers. 4. Nestle management should implement fully the agreement signed by the management and union. Also please contact trade unions and other labour organisations to send protest and solidarity messages. Previous PostNo to India-Japan Nuclear AgreementNext PostIs Modimania on the Wane?